Boil the baby potatoes in rapidly boiling water until just tender. Drain. Place the asparagus in rapidly boiling water and boil for 2-3 minutes. Drain and refresh under cold water to stop cooking process. Melt the butter and mix with chopped parsley. 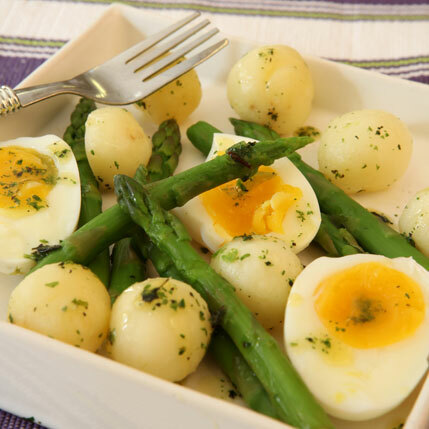 Halve the eggs and place eggs, asparagus, and potatoes in a serving plate. Drizzle with parsley butter, season and serve.